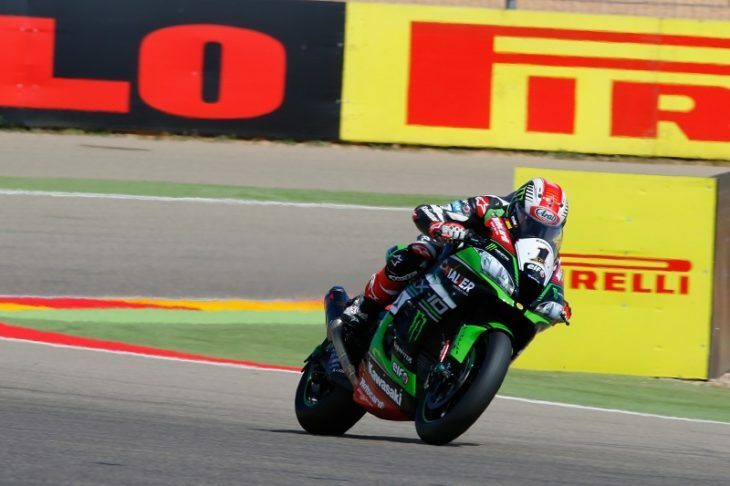 Jonathan Rea (Kawasaki Racing Team) put in a 1’50.062 lap late in FP2 at MotorLand Aragon on Friday afternoon to complete the day as the quickest man on track, with Marco Melandri (Aruba.it Racing – Ducati) and Tom Sykes (Kawasaki Racing Team) also in the top three on the timesheet. Rea earlier carried out a 19-lap run at the beginning of the session, gathering plenty of information ahead of Saturday’s Race 1, the fifth race of the season. The year has started with four consecutive wins for the defending World Champion already. A good lap by Melandri towards the end of FP2, as he went round just 0.099s behind Rea, saw him finish the session second, with Sykes in third (+0.243). Chaz Davies (Aruba.it Racing – Ducati) recovered from a difficult FP1 to finish fourth best in FP2, with Alex Lowes (Pata Yamaha Official WorldSBK Team) completing the top five. Spaniards Xavi Fores (BARNI Racing Team) and Jordi Torres (Althea BMW Racing Team) were sixth and seventh fastest respectively, ahead of Michael van der Mark (Pata Yamaha Official WorldSBK Team), Eugene Laverty (Milwaukee Aprilia) and Leandro Mercado (IODARacing) in the top ten. Stefan Bradl (Red Bull Honda World Superbike Team) and Nicky Hayden (Red Bull Honda World Superbike Team) were both inside the top 12 but will have to try their luck in Tissot Superpole 1 on Saturday. Just under 15 minutes before the end of the session the safety stewards around the track raised their white flags to advise the riders that spots of rain were beginning to fall, but a number of FP2 participants were still able to improve their lap times in the final minutes. Rea was also the fastest rider in FP1 on Friday morning at the Pirelli Aragón Round, his 1’50.570 putting him ahead of his rivals at the head of the timesheet in front of Lowes and Fores. Davies was hindered by a technical issue in FP1, only riding for a short time and ending up at the foot of the timesheet with a 1’53.896 best lap, +3.326s off the pace, with smoke pouring from his Ducati Panigale R at one stage. On Saturday morning the riders will return to the track for FP3 at 8.45am local time (GMT +2) at the #AragonWorldSBK round, with Tissot Superpole 1 at 10.30am, Tissot Superpole 2 at 10.55am and Race 1 at 1pm.